EnviroMin for ME; vital for bones, arterial health, skin, nails, hair, and digestion. Plus, get the added benefits of a Gentle Daily Detox to protect against harmful environmental toxins. Organic, Vegan, Glutten Free, non GMO sourced only in the USA. Our plant sourced, organic minerals provide a natural balance of trace minerals plus the most important mineral; Silicon. Silicon is the primary building block for bones, skin, teeth, nails, hair. Without it we cannot properly absorb our other needed minerals and nutrients. It used to be found in our soils and spring water. Now, it is severely depleted. Read more on where our minerals come from by clicking here: What Is It? Stir easily into water or juice morning and evening. Designed to use everyday. Add 1-2 scoops (tsp) to a glass of water or juice. Add to your water bottle before you go out. Add to hot water for a soothing Mineral Tea just before bed. Sleep better, feel better. Phytolithic Silicon; from fresh water Phytoplankton, 70 naturally occurring trace minerals, organic vanilla essence. Sourced only in the USA. Our bodies are well designed to perform a daily detoxification; the vital "flushing", cleansing, or removal of toxins. The key organs or systems that perform this vital task everyday are: The skin, digestive tract, lungs, blood, lymphatic system, kidneys, and the liver. Unfortunately, many "detox diets, shakes, herbs, pills, or potions" can be very harsh, expensive, taste terrible, and offer only short term results. The safest way to detox is to support the body on a DAILY basis. 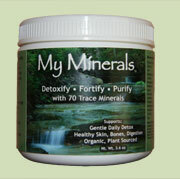 Organic, full spectrum, plant sourced minerals are the simple "Gentle Daily Detox" solution. EnviroMin Minerals support the body's daily cleansing of harmful toxins, chemical residues, heavy metals, and parasite waste; gently and safely. Our dry powder formula supports the body's natural cleansing of the digestive tract to allow for better nutrient absorption and better overall health. Since Phytoplankton are plants, the body recognizes it as a whole food, not a supplement so it works better! If your body is clean and healthy on the inside, you will be healthy and beautiful on the outside. Trace minerals are the keys to longevity in all living cells. Plants, untreated with chemicals, have a naturally occurring balance of 70 major and trace minerals. The full spectrum of 70 is vital since minerals are self-regulating. They ALL need to work together, in a complete balance, to aid in the absorption of other vital nutrients. All together they naturally help balance the digestive tract. EnviroMin Minerals are from Phytoplankton, nature's most complete microscopic plant. The body recognizes our full spectrum blend as a "whole food" for optimum absorption and no over supplementation risk. EnviroMin Minerals are naturally ionized, and naturally chelated, so they are more bio-available and easily absorbed. That is our formula: Simple, Basic, Natural. Follow us on Facebook for specials, discounts, and deals. Join us on Pinterest for fun and special discounts. Send us your testimonial video and we will send you 3 FREE jars of EnviroMin Minerals! Send us your best tips for using EnviroMin Minerals, we award FREE jars every month to the top entries.